Ultra creamy Crock Pot sweet potatoes are the most effortless recipe you’ll ever make! Pop them in the slow cooker and cook all day for an easy, healthy dinner side. Note: This is a new series where I provide one base slow cooker recipe and three ways to serve it. For the links to the ways to serve these crock pot sweet potatoes, scroll to the bottom of the post. 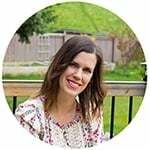 Guys, I am really excited to start a new series on the blog. One thing I’ve come to realize over the past year is that you guys LOVE slow cooker recipes. And that’s just awesome, because I love my slow cooker, too! One problem I’ve always had with my slow cooker is that often times it cooks really large batches of food. Big batch shredded chicken, or beef, or large amounts of sweet potatoes. As a family of three, we always end up with lots of left-overs. Rather than eat the same dish over and over again, I thought it would be great to come up with multiple ways to use these left-overs! 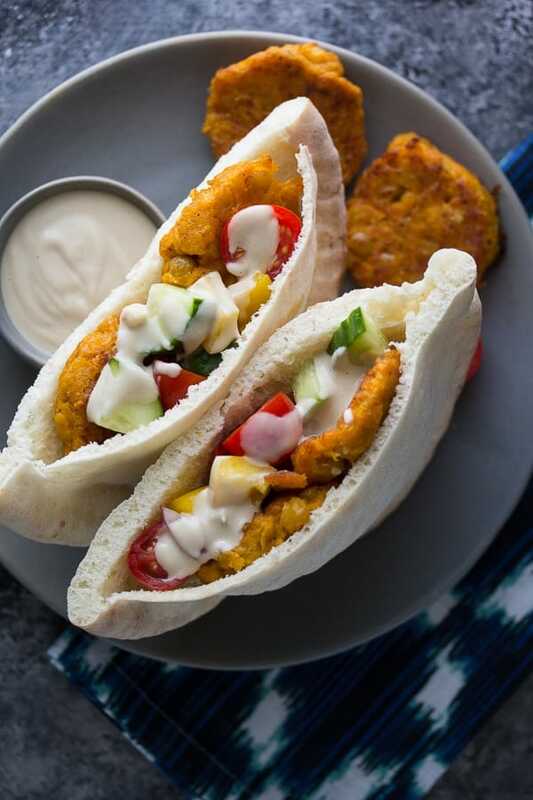 Even if you have a big family and don’t end up with left-overs, I hope these recipes can help you diversify your dinner routines. Having slow cooked portions (be it chicken, beef, or sweet potatoes) on hand makes dinner SO much quicker to whip up. So let’s get started! Today I am sharing a (ridiculously easy) recipe for crock pot sweet potatoes. If you can even call it a recipe. Because all it is is sweet potatoes + slow cooker. And after 8 hours on low, you are going to have the most tender, creamy sweet potatoes ever! 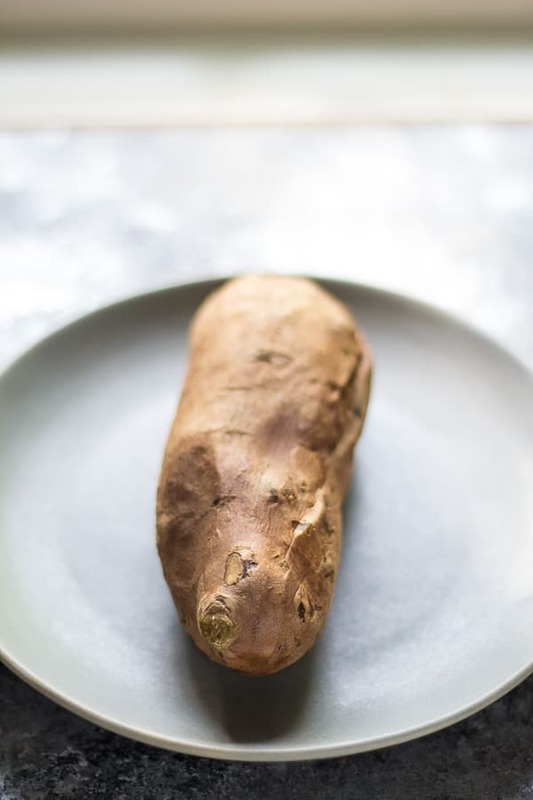 Want to cook your sweet potatoes in the Instant Pot? Check out this Instant Pot Sweet Potatoes tutorial! Wrap ’em in some aluminum foil (I like this because then you can just pop them into a tupperware in the fridge and they seem to keep pretty well this way). Place in the slow cooker. You can probably fit 3-5, depending on the size of the potatoes, into a 4-quart slow cooker. And voila! Perfectly cooked, ultra creamy sweet potatoes! Ultra creamy Crock Pot sweet potatoes are the most effortless recipe you'll ever make! Pop them in the slow cooker and cook all day for an easy, healthy dinner side. Wash sweet potatoes and pat dry. 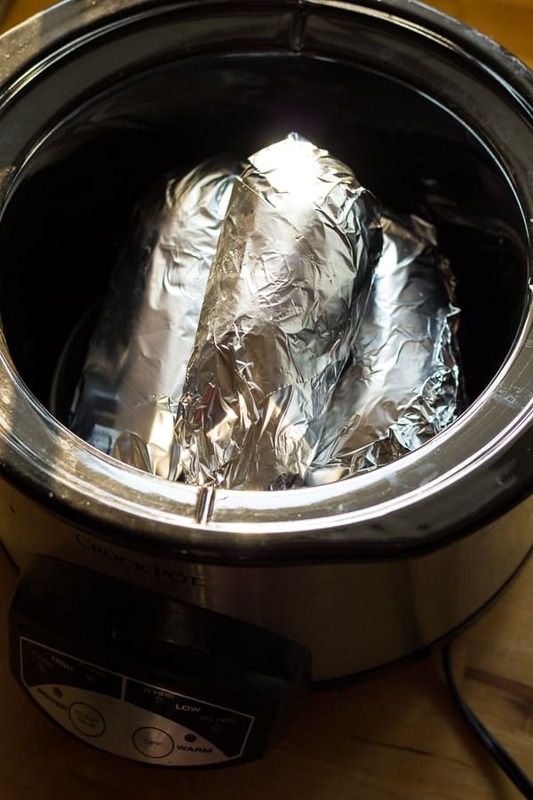 Wrap in aluminum foil and arrange in your slow cooker. Place the larger sweet potatoes on the bottom and any smaller ones on top. Can I avoid the foil? I try to produce as little garbage as possible. Hi Monica, that’s a great question! I’ve pretty much removed all aluminum foil from my kitchen these days, but I haven’t made these without. If you try it, would you let me know how they turn out? Any idea how many cups one potato yields? 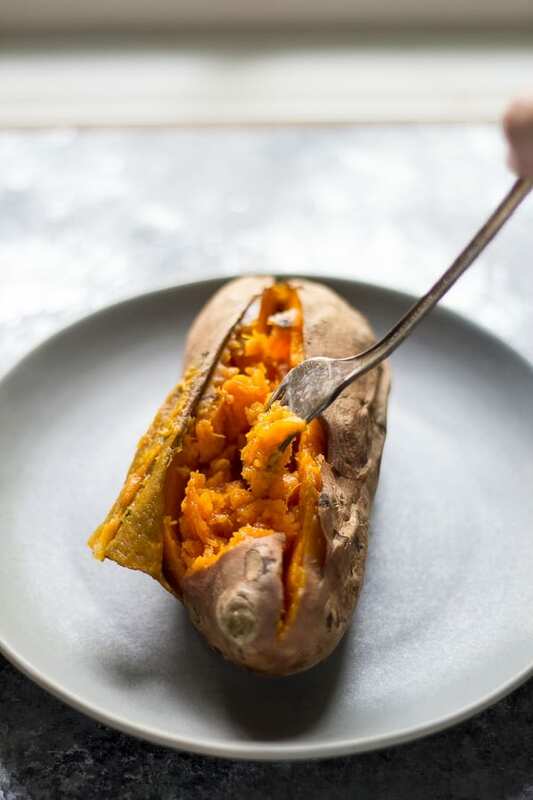 Do you place the foil-wrapped sweet potatoes on top of wadded-up foil in the slow-cooker or just set the foil-wrapped sweet potatoes down in the slow-cooker without anything under them? Hi Norma! I just placed them in without any foil on the bottom of the slow cooker, they did leak out a small amount of liquid, but it was easy enough to clean up. This is such a great idea, Denise!! I could eat sweet potatoes every single day! 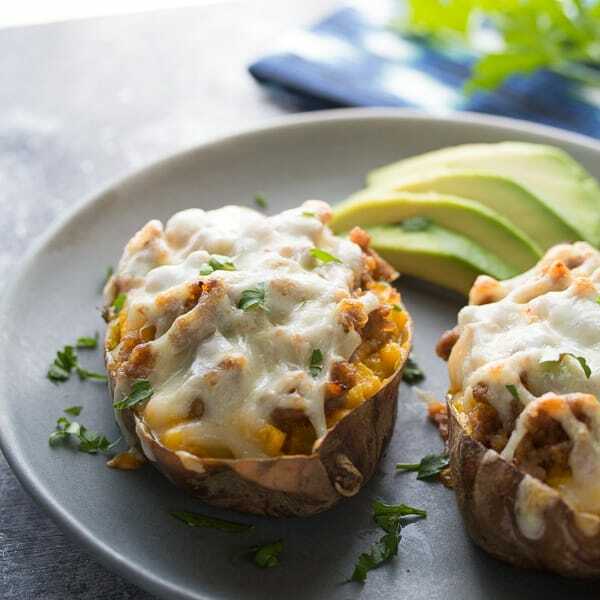 I love them so much I’ve been dealing with the heat from the oven just so I can get my fix, but cooking them in a slow cooker is such a great idea for the summer! Basically I want to eat all of these dishes! Ahh yum!! This series is PERFECT Denise. It’s just the two of us and while we love our slow cooker to bits, sometimes eight tons of pulled chicken, beef, etc. gets old. I love all of these sweet potato recipes. I’m so glad you like the series, Jessica! I hate throwing food away, and sometimes that’s what ends up happening. Oh, man. That is seriously the ONLY way I want to cook my sweet potatoes from now on! 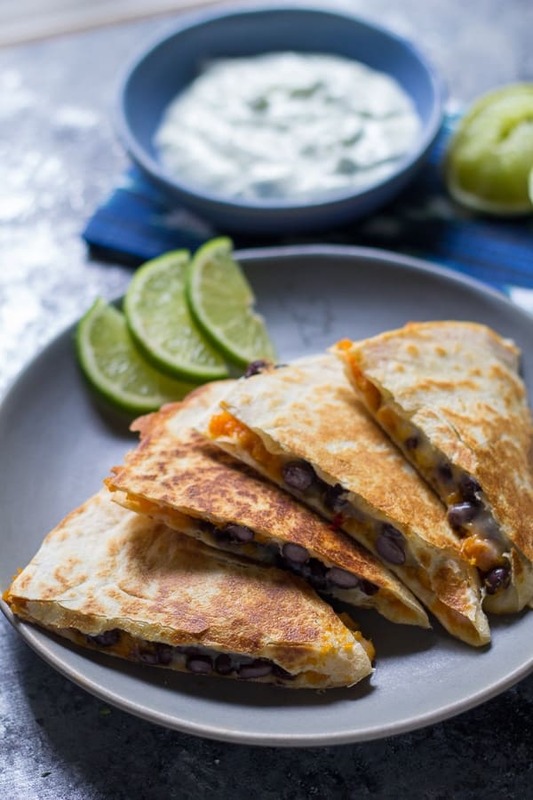 Loooove all the things that you can do with the sweet potatoes afterward especially those quesadillas! Indeed we like slow cooker recipes!! It makes the whole cooking experience effortless and, at time, that’s all we need ! Thanks, Emanuele! I’m definitely still learning my crock pot, but the more I use it, the easier it gets! Denise!!! I love this new series! I love slow cooker recipes!!! I didn’t start using my slow cooker in the summer until recently .. and probably won’t pull it out on the really hot days but I’ve been loving it! 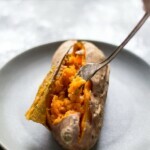 such a time saver on busy days .. and LOVE sweet potato recipes!! bring it on!!! Yay. I love this new series! So fun! Slow cooker meals are my favorite and such a lifesaver. We eat a lot of sweet potatoes and each one of these meals would be a hit! They look amazing! Thanks so much, Kelly! I can’t get enough of sweet potatoes…my favorites! It’s hard to argue with gooey cheese, isn’t it, Kristine 😉 Thanks! Denise, I love that you’ve given me a brand new oven-off way to bake potatoes! This is so cool, and I intend to to use it. I love my sweet potatoes, and your recipes look wonderful. Can’t wait to see the full posts! Yes! I can never get them as soft and creamy when I roast them in the oven…I don’t think I’ll ever do them in the oven again! What a fun idea! I’m the same way with my slow cooker – it can make such large batches! All three of these sound delicious! Thanks, Ashley! I always have a ton of left-overs that I don’t know how to use! I’m so glad you like the series, Olivia! I get pretty bored eating the same thing over and over again. Loving this new series! And so smart to do the sweet potatoes in the slow cooker. Then I can come home from work and they’ll be all ready for me. The best! Exactly! And you don’t have to turn on your oven! Thanks, Natalie! This is such a fun series, Denise! I’ve never even thought to cook sweet potatoes in my slow cooker. Such a great idea! You should try it, Gayle! It is the easiest thing ever…I don’t think I’ll ever cook them in the oven again!